As the Osa Conservation Wildcat program has shown us time and time again, cameras are an extension of our eyes into the forest. They sit there quietly, waiting to witness what wildlife happens to unfold before them. Our cameras on the ground have allowed us to track animal populations throughout the Osa Peninsula, giving us new perspective on the tendencies and patterns of the animals with whom we share a home. But are we missing something? Look up! As anyone who has been to a tropical rainforest knows, some of the most exciting wildlife extends far above the forest floor and into the dense and diverse canopy. Birds, monkeys, and even some species such as porcupine, kinkajou, coati, and the allusive margay spend much of their lives out of sight, but certainly not out of mind of scientist everywhere. In an effort to better study these incredible species, Osa Conservation is starting a Canopy Camera Trap Project in conjunction with DANTA; a nonprofit focused on education based conservation. As a long term friend of Osa Conservation and supporter of the camera trap programs, DANTA hopes to help Osa Conservation in extending our eyes upward to start producing baseline research in order to better understand populations of arboreal mammals. The most active species in the canopy are, to no one’s surprise: monkeys, which are of particular interest to DANTA director and primatologist, Kimberly Dingess. This project will seek to aid DANTA research as well as assist visiting students and organizations in better understanding all the action occurring above our heads. But the scope of the project does not stop there! As any nature lover knows, a quiet set of eyes in the rainforest can expose a wealth of information and has implications far beyond the fauna. With a long term monitoring program, we will be able to utilize long term cameras to observe the flora of the Osa forest, allowing us to document shifts in phenology, or blooming and fructification, of the trees. This new technology will provide new data with regards to climate change and the affect it has on the distribution of both arboreal and terrestrial mammals. The videos were captured in our first trial run with a camera about 15 meters up in a tree on our Cerro Osa property. The first video features a Capuchin monkey, one of the four species present on the Osa Peninsula. These particular monkey species are highly intelligent and social animals which tend to travel in troops of up to 40 individuals. On a trip to the Osa you are very likely to see these little guys climbing, playing, or eating any number of tree fruits! The second video features a kinkajou, a mostly arboreal mammal most closely related to coatis and raccoons. Seldom seen by humans due to its nocturnal habits and the fact that it rarely touches the ground, this footage allows us to gain new perspective on the adorable nature of this curious species. As our camera trap programs grow, so does the potential for new questions, answers, and most importantly, new ways to work towards conservation of the beautiful Osa Peninsula. Stay tuned to see what comes of the canopy camera trap program!! The Amazon Conservation Team (ACT) recently held a major international, intercultural planning meeting last week in the Osa Peninsula. Attendees gathered from offices in Colombia and Suriname and also the ACT Headquarters in Arlington. Tribal representatives from six different partner communities also traveled from far and wide to participate. The meeting was the brainchild of Liliana Madrigal, Vice-President and Co-Founder of ACT, who also serves as Osa Conservation’s Board President. 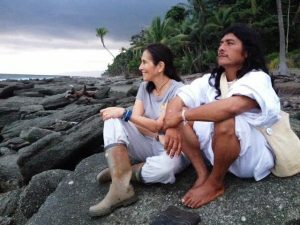 A native Costa Rican, Liliana helped found the Nature Conservancy’s International Program and Conservation International. She was also one of the very first winners of the prestigious Skoll Award for Social Entrepreneurship. The Osa Peninsula was chosen for the setting of the meeting because it is “halfway to everywhere” and ideal for bringing together people from Brazil, Colombia, Suriname and the U.S. More importantly, it was decided that Osa was a place where both indigenous (and non-indigenous) people from South America could see first-hand rainforest conservation success stories since Osa has an intricate and complicated mosaic of different landscapes (national park, research station, private lands, etc.) that are managed in sync, thanks primarily to Osa Conservation and other local colleagues. All the attendees were very impressed: by the forest, the research stations, the infrastructure, and – most of all – the fierce dedication and generous hospitality of the Osa Conservation staff. We will return! Once, the idea that animals would go extinct was unthinkable; it was believed that the world’s resources were so vast that they could never be extinguished. Yet, the dwindling numbers of so many well-known species such as the ferocious Tiger tell a different story. Extinction is a natural phenomenon and should occur at about 5 species per year. However, human intervention, climate change, and other factors, that rate is much accelerated and has been estimated by the Center for Biological Diversity to be 1,000 to 10,000 times the rate that it should be. In other words, the rate of extinction is terrifying and means that thousands of species are going extinct each year. Because of a few high-profile extinctions such as that of the famed Wooly Mammoth and Carrier Pigeon, people often use these stories as a framework for thinking about human impact. In fact, the threat of extinction is one of the most powerful drivers to action in the environmental world. Perhaps it’s power is rooted in our sense of loss, the idea that a familiar animal will be unknown to our children. Perhaps it’s the finality of extinction–the idea that those animals are never coming back. Whatever it is, extinction is more than a threat–it is rampant in our world. Extinction is extremely hard to document, and measurements of the overall health of the planet and its inhabitants is much more complex than the binary: “extinct” or “not extinct.” Not only is it difficult to track rare and undiscovered species, but there are many, many factors that go into such a general measurement. As Robert May, a leading extinction-rate expert, put it, “If we are to meet the challenges facing tomorrow’s world, we need a clearer understanding of how many species there are.” So…what to do? Well, it actually is possible to come up with an estimate of existing species, based on estimates of habitat loss and how many species are known to currently exist, and how many (we think) have existed in history. These estimates are relatively accurate and can be used in all types of research. Additionally, because thousands of new species are discovered every year, scientists are constantly discovering new ways to track important information about unknown and rare species. For example, the Yellow Billed Cotinga has been historically difficult for scientists to track, as it is exceedingly rare. However, thanks to the Yellow Billed Cotinga Sanctuary in the Osa and some hard work, more and more is being discovered about these illusive birds daily! 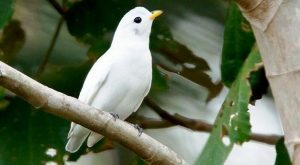 The Yellow Billed Cotinga (Carpodectes antoniae), the Snowy cotinga (Carpodectes nitidus), and the Black-tipped cotinga (Carpodectes hopkei) are all considered “white” cotingas. Of these three, only Yellow Billed and Snowy cotingas live in Costa Rica, but in different regions, making it very unlikely that their habitats will ever overlap, as if they weren’t difficult enough to track! 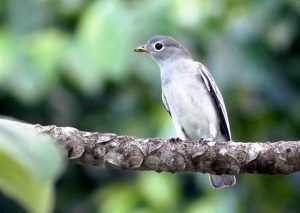 In fact, everything that we know about this highly endangered Costa Rican resident bird species comes from a single source: a series of telemetry studies beginning in 2009. Despite the fact that the Yellow Billed Cotinga has a population of a mere 250-999 individuals and is found only on the southern Pacific coastal slope of Costa Rica, advanced technology has allowed scientists to conduct some pretty in-depth research. 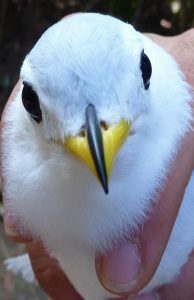 In order to conduct this research, researchers captured three separate Yellow Billed cotingas (one adult female and two adult males) from a small population living in the mangroves of the Osa Peninsula and fitted them with small radio transmitters. This allowed ornithologists (in collaboration with Osa Conservation as well as the American Bird Conservancy) to follow all three birds using nothing but their radio frequency signals and a hand-held GPS unit. From these studies, scientists learned the actual distribution, habitat use patterns, daily behavior, and even spatial/temporal movements during the reproductive and non-reproductive times of the year. We will not compile all of the data from those studies here, but there were a few interesting findings. The Yellow Billed cotinga grows to about 8 inches or 20 centimeters long and is often described as looking somewhat like a dove. These birds spend most of their time in the tops of trees and move in relatively small groups. Additionally, they eat mostly fruit and possibly some insects. Mating for the Yellow Billed cotinga is very interesting. In fact, courting rituals are fairly complex and, like a gymnast on parallel bars, males perform fancy flying maneuvers between leafless branches. After mating, the real teamwork kicks in and as the female becomes a 24/7 housewife, males spend time feeding and making their territorial rounds. Another major finding about the Yellow Billed cotinga is the fact that it uses two habitats: mangroves for nesting, foraging, and roosting; and lowland forests for foraging. This finding is perhaps the most significant as it is critical information for conservation purposes. If we understand where these guys live and what is special about that specific habitat, then we know the most significant pieces of the rainforest to protect. Coincidentally, the Pacific coast of the Osa Peninsula is a perfect habitat for the Yellow Billed cotinga, as mangroves and lowland rainforests are in close proximity to each other. The fact that the Yellow Billed continga depends on the mangroves for nesting, foraging, and roosting is no surprise. 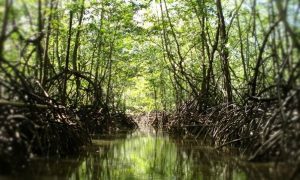 In fact, the more research done about mangroves, the more scientists discover the specific and crucial role that these plants play. A mangrove forest is a coastal forest made up of salt tolerant trees (halophytes) that are specifically adapted to life in harsh coastal conditions. The roots of these trees contain a complex salt filtration system in addition to an interesting root system to cope with salt water immersion and wave action. 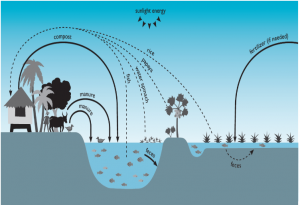 Not only do mangroves provide an important erosion buffer on coastlines around the world, the complex system of roots is often used as an ideal location for many types of animals to lay eggs, create nests, raise young ones, and even hunt. The Yellow Billed cotinga also depends on the lowland ‘moist’ rainforests, also present in the Osa. This is a very specific habitat that exists only in areas that bet between 1500 and 3000 mm of rainfall annually. Because of the specific climate, lowland rainforests contain taller trees than other forests and has a unique animal species distribution that changes rapidly over short distances. 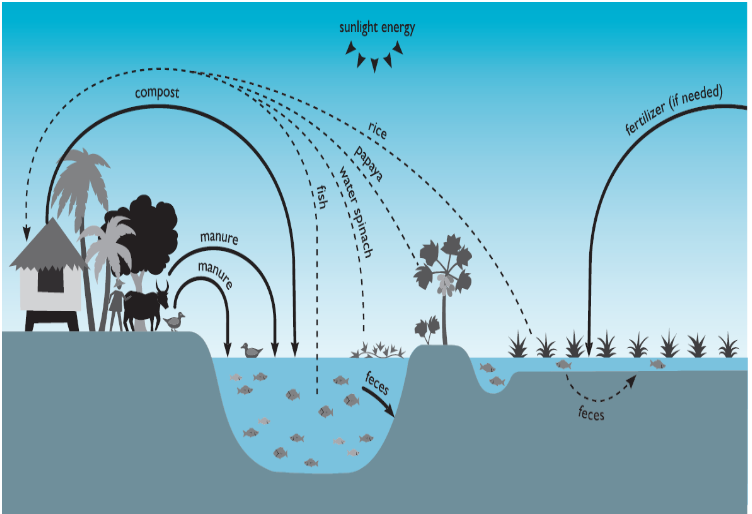 Mangroves as well as lowland rainforests are microclimates with high specificity and massive importance to many species not only in Costa Rica, but around the world. Research on the organisms that rely on these microclimates is critical to understanding the real impacts of climate change and habitat destruction for future prevention as well as rehabilitation. It is with this research and other studies like it that conservationists have the knowledge they need to effectively make a difference in long term conservation efforts. Understanding the threats to the Yellow Billed Cotinga as well as their key habitats, behaviors, and preferences has allowed their final remaining stronghold, the Osa Peninsula and Golfo Dulce to become a Yellow Billed Cotinga Sanctuary. This is designed to protect the cotinga from threats such as habitat degradation due to deforestation and agricultural runoff. 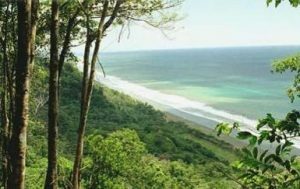 The sanctuary itself is located near the town of Rincon on the eastern side of the Osa Peninsula and is a 11.8 hectare property frequented by more than just the Yellow Billed cotinga. The Prothonotary Warbler, Northern Waterthrush and Yellow-throated Vireo have all been seen by birders on site. The Yellow Billed Cotinga Sanctuary helps connect the mangrove forests of Rincon to the lowland forests located more inland. Additionally, its location near the Rincon River helps ensure passage of Cotingas moving from their nesting grounds in mangroves to their feeding grounds in the rainforests. With efforts like the creation of the Yellow Billed Cotinga Sanctuary, Osa Conservation hopes to conserve critical biological regions of the rainforest and begin working towards the stabilization of the Yellow Billed cotinga population, currently so low that the species is listed as endangered by both the IUCN’s Redlist and Birdlife International. With the help of research and a comprehensive understanding of the deeply interconnected nature of the rainforest, we can strategically map out a plan for effective and cohesive conservation for the many animals, plants, and insects facing extinction. Note: Osa Conservation conducts annual avian monitoring and surveys in the YBC Sanctuary and its other properties in order to have a record of species and change over time, and to measure the success of their efforts.